This 8-9 inch bracket fungi was growing in our wood on a piece of deadwood. It is amazing how it launches itself out of the birch bark. 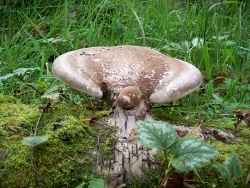 A quote from http://www.first-nature.com/fungi/piptoporus-betulinus.php “This large polypore develops from a small white spherical swelling on the side of dead or living birch trees. Barbers used to 'strop' or sharpen their cut-throat razors on tough, leathery strips cut from the surfaces of these polypores, and so they became known as the Razor Strop Fungus.” A history lesson all of its own.